I just found out this groovy feature in Ask Ubuntu, if I click on the score of a question or answer it shows the score breakdown (the number of upvotes and downvotes). For example, for this question titled How to list all installed packages, it shows the following. 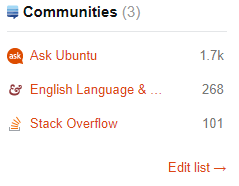 But to my surprise I couldn't find this feature in any of the popular Stack Exchange sites listed below. Disclaimer: I opened all those sites except Stack Overflow and English Language & Usage as visitors (didn't log in). Also I have very little reputation in those two sites. If this feature depends on the user reputation this question is meaningless. Is this something special to Ask Ubuntu? If so, is there any particular reason why others didn't employ it? Yes, this exists as a feature of all sites in the StackExchange system (to my knowledge), which includes StackOverflow and all the other StackExchange sites. HOWEVER, it's a privilege that you need to unlock on a per-site basis, by gaining rep on each individual site. You need obtain and then maintain 1,000 or more reputation points to get that privilege.